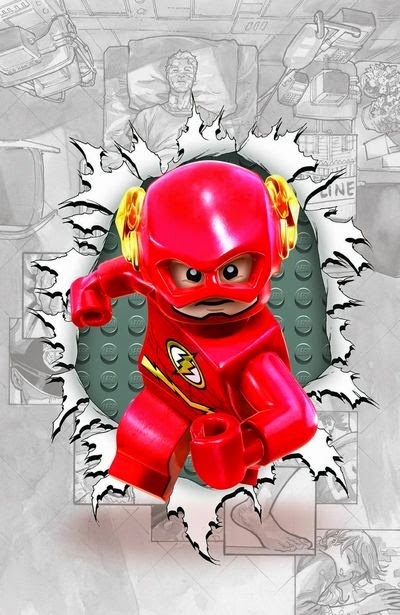 In order for DC Comics to give their November themed 'Lego Month' some form of street cred, they decided to ask their creators to develop something urban and original. So that is why Robert Venditti and Brett Booth went to a weight loss centre and made a trampoline out of some of their clients. Boing! To QUOTE A Picture I Once Saw On Facebook: 'Life is a story. Make yours a best seller'. 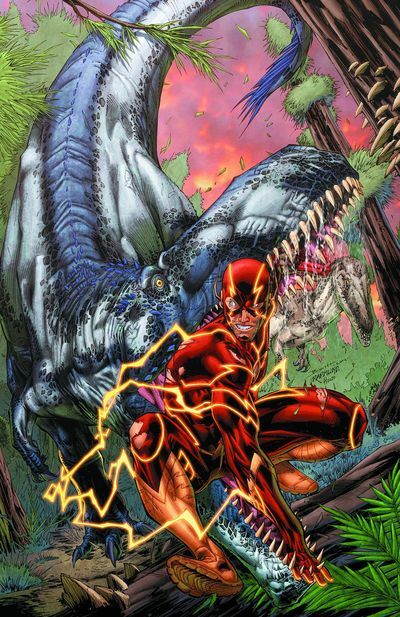 Now can you guess what Future-Flash does after the topsy turvy events shown last issue? No. He doesn't delve into the time-stream and search for his present day de-powered counterpart, silly! What he does instead is make a new life for himself in Central City. Well, why not? After all he does look appropriately younger thanks to his slippery shenanigans. For a start he plays a bit of tonsil tennis with Patty Spivot. Then he looks after Wally West by showing him round his place of work. And after that he decides to kill someone who might possibly do something bad in a future time-line that may or may not exist. On the whole I thoroughly enjoyed reading this amazing issue of 'The Flash'. To start off with I best mention how I noticed Brett's and Andre's dynamic looking artwork gelling together pretty damn well thanks to Norm's unifying efforts. And I have to admit, I did like the way all three artists were able to show a lot of expression and emotion in their characters faces and postures -- particularly Barry's. What's more, I did find the overall narrative rather captivating to follow. One part of it centred on 'real Barry' meeting some mysterious nomad in a jungle themed 24th century (I wonder who he is?). Where as another part of the story -- the fairly groovy part -- focused on Future-Flash acclimatizing himself in his counterpart's shoes (the git). OK. I know what some of you are thinking. You're thinking we all saw this before when John Fox usurped Wally West's throne all those years ago. But this time dear reader there's a really nice twist to the premise. Barry is Barry. The New 52 isn't exactly the Old 52. Plus generally speaking in this instance there is a more bubbly tone to it as well. A bubbly tone that is very charming and mysterious to peruse. The only thing about this adventure I wasn't too sure about was the way Future-Flash was suddenly de-aged. From my point of view this occurrence felt a bit too staged somehow. As if it was meant to be there just to serve the purpose of the plot! But then again, how would I know, eh? As I said previously, by in large this was a pretty decent story, in spite of this 'fairly coincidental' hic-cup. If you want to know why I'm musically matching up this comic book to the following song, please refer to the next answer for more details. Many thanks. Now I know this may sound somewhat strange, dear reader. 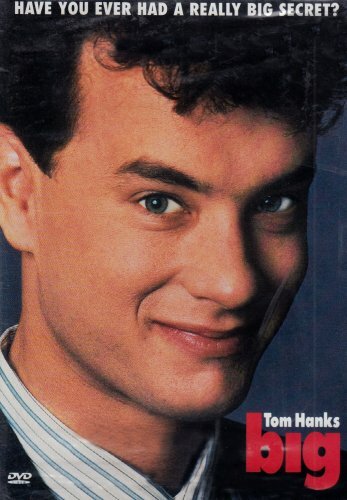 But in my eyes Future-Flash's current youthful exuberance -- compiled with his boy-ish attitude and naive charm -- compels me to compare this tale to the Tom Hank's comedy classic, 'Big'. There was a scene in this issue where Future-Flash implied that someone he saw in it will defiantly die in one year's time. So just for fun -- kind of -- can you guess who it is out of the following seven suspects? David Singh -- Well, it was a bit strange when Barry acted so warm around him, eh? As if this was his way of re-connecting with a lost one, so to speak. Patty Spivot -- The only reason I would put Patty to this list is because of how Barry embraced her so passionately when they re-meet. In some way maybe this is his way of stoking the old fires, hint-hint! Wally West -- I'm not too sure about Wally, really. I think he's pretty safe all in all. Especially since we all know how he bit the biscuit last issue. Tim -- You know. That engineer chap that Barry introduced Wally to when they both visited the police garage. Iris West -- Like Wally, I think Iris is pretty safe as well. And you never know, if Patty dies, then maybe there's a chance for her and Barry to get back together again! James Forrest -- In contrast with how he greeted David, I felt Barry appeared slightly distant to his old pal Forrest. Almost as if he didn't want to get too close again. Doris Day -- I'm sure I saw her in this comic book. But then again it could also be all the drugs I'm taking.